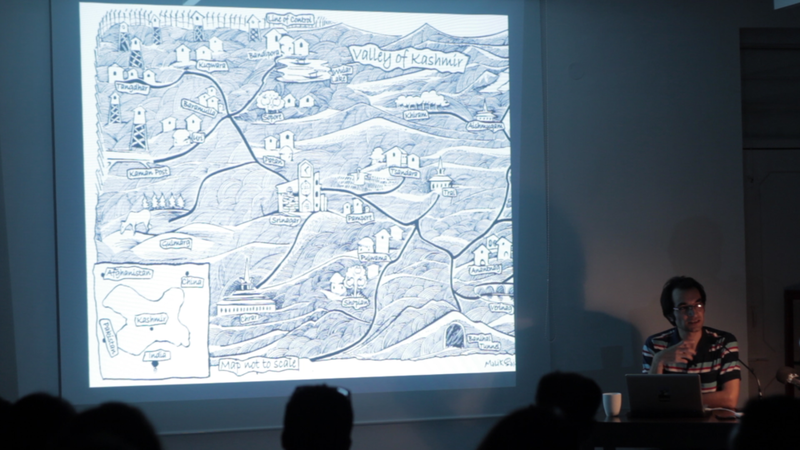 FICA presented Visual Storytelling: Communicating experience without repeating the event, a talk by Srinagar-based graphic novelist Malik Sajad. The talk focused on how visual storytelling can universalize the scope of stories dealing with the lived experiences in the manner in which those stories can be conveyed and understood by others. The evening talk is part of the ongoing course titled 'The Storytellers. : A Course exploring Zines, Comics and Video'. Organised in collaboration with Serendipity Arts Foundation, the course is geared towards young practitioners who are looking for a mentored environment to develop their practice and explore diverse mediums and materials, in close engagement with experienced practitioners. It is designed to explore multiple layers of visual storytelling and these mediums through three modules on video art, comics/graphic narrative and zines. Each module is five days long and will explore multiple possibilities of visual storytelling through fiction/non fiction, based on news, reports and many different and immediate concerns of the life around us. The talk was an extension of Malik's module titled 'Drawing Experience' that concentrates on the medium and making of the graphic novel. It was centered on discussions of how comics are being mobilised around the world by artists to document their political realities through a personal eye. It focused on different visual vocabularies, and using them to create individual bodies of work while exploring and playing with normative understandings of plot, narrative and storytelling. Malik Sajad is a visual artist and writer. The thematic content of his work revolves around human conditions and the psychological consequences of socio-political uncertainties. 'Munnu: A Boy From Kashmir', published by HarperCollins, UK, is his first graphic novel, which won the Verve Storyteller Of The Year Award and included as a part of the permanent collection (Artists’Books) at the Brooklyn Museum in New York. Malik is an Inlaks Scholar (2011) and OMI, Francis Greenburger Fellow (2013). He studied visual art and storytelling at Kashmir University and Goldsmiths, University of London. Prior to publishing Munnu, Malik wrote several short stories documenting the human toll of political crises across South Asia such as Identity Card, The Posterman, EndangeredSpecies, Facebooked, Gulberg Society Massacre Timeline and Side Effects of Fairness Cream. He received FICA's Amol Vadehra Art Grant in 2017-18, a grant aimed at supporting an Indian artist to develop a body of work.